Nature School (previously the Homeschool Program) is a seasonal, ten-week immersive outdoor play and learning program designed for children ages 5 to 12. 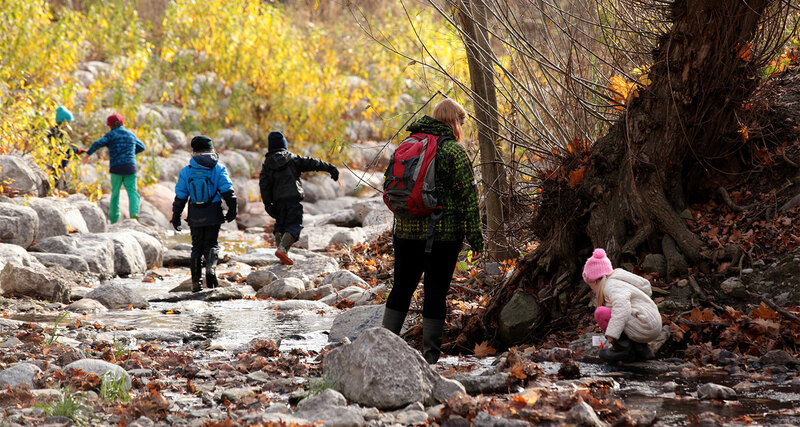 Utilizing a Forest & Nature School-inspired approach, Nature School at Evergreen Brick Works supports children in experiential learning, engaging in healthy risk-taking and letting their curiosity lead their learning as they connect with nature in a hands-on way. Building on Evergreen's extensive experience in outdoor learning, play and placemaking, this program is perfect for students being schooled at home or for families interested in providing their child with an opportunity to take a day off from school to spend time outside learning from nature, building a strong connection to the local landscape and community, and developing lasting relationships with peers outside of the home or classroom environment. Download our Parents' Handbook (PDF 1.8MB) for further information and details. Nature School is based on eight guiding principles. Read our guiding principles. Wednesdays, April 3 to June 12, 2019. *Please note there will be no Nature School on Wednesday, May 1st, 2019. Registration for Spring Nature School opens on February 4, 2019 at 9am. Please note, fees are for the entire session, not on a day-by-day basis unless otherwise specified. We will not refund fees for days missed, and any day missed cannot be made up. No refunds will be issued if a reservation is cancelled within 21 days of the session start date. Otherwise, camp fees are refundable, less a $25 administration fee. Please note, registrations are non-transferable. Refunds will not be issued for missed camp days due to inclement weather, including flooding. Requests for cancellations or refunds must be made in writing and submitted to camp@evergreen.ca. Through play, children can develop social and cognitive skills, mature emotionally, and gain the self-confidence required to engage in new experiences and environments. Moving the body to engage the mind. Starts by posing questions, problems or scenarios—rather than simply presenting established facts or portraying a smooth path to knowledge. The process is often assisted by a facilitator. Providing children with direct contact with nature. Creating a compelling learning setting through multi-sensory, direct experience. Weaving together expectations from across the curriculum through ecological themes and engaging experiences. Building a foundation of knowledge through a focus on local nature, culture and community. For more information, please contact us at camp@evergreen.ca or 416-596-1495 x452. If you are a school or other group planning on visiting Evergreen Brick Works, please review our Information for Visiting Groups (PDF 58kb) before your visit. Evergreen is a national not-for-profit dedicated to making cities flourish. Children’s camp revenues help support our children’s programs including the Visiting Schools Program as well as the free community programming on weekends at Evergreen Brick Works. We appreciate your support in continuing to offer these community programs to children in Toronto. Evergreen is proud to be accredited by the Ontario Camps Association. The OCA works to preserve, promote and enhance the camp experience for children and adults. Evergreen has voluntarily submitted to an independent appraisal completed by camp experts and has met up to 300 health, safety and quality program standards, from staff qualifications and training to emergency management. OCA Accreditation is a parent's best evidence of a camp’s commitment to health and safety.